The finest single acquisition in the Birnkrant Collection is “Gus White’s Punch and Comic Family.” For years, it has been my intention to create a website documenting and sharing this important National Treasure. To be permitted to be its custodian, if only temporarily, is an Honor and a responsibility. To do it justice in a website will be a major undertaking, and it is something I have contemplated doing for many years. Sitting here this morning, wondering what character or category in the collection I should address next, I, just now, realized that it would be ridiculous to document this collection, without even mentioning Gus White’s Punch, simply because I plan to do a bigger better website, dedicated to it, in the future. The clock is ticking faster these days, and I am moving slower. The only future may be present. I think I’d better include it here, at least for now, and do an entire website, later. I already have a bunch of pictures ready! 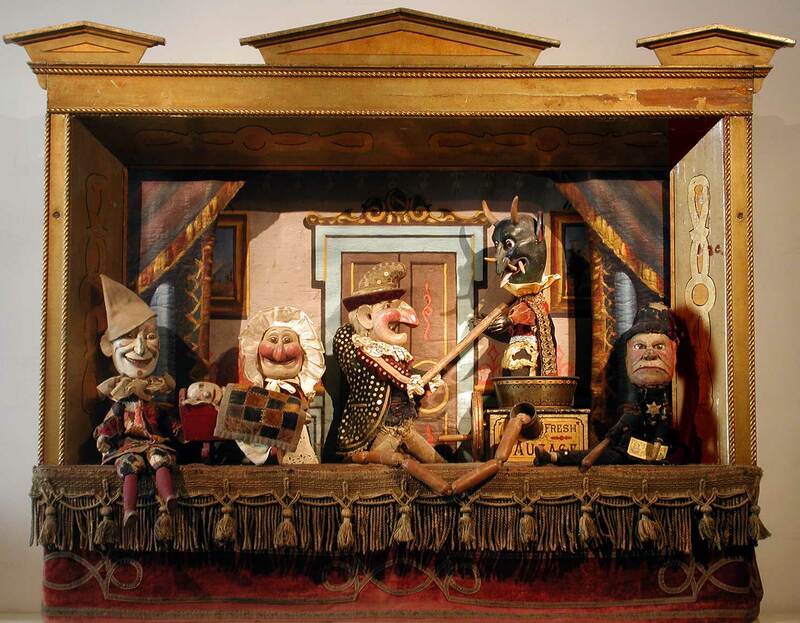 There is no need to rationalize Punch and Judy being part of a collection of Comic Characters. 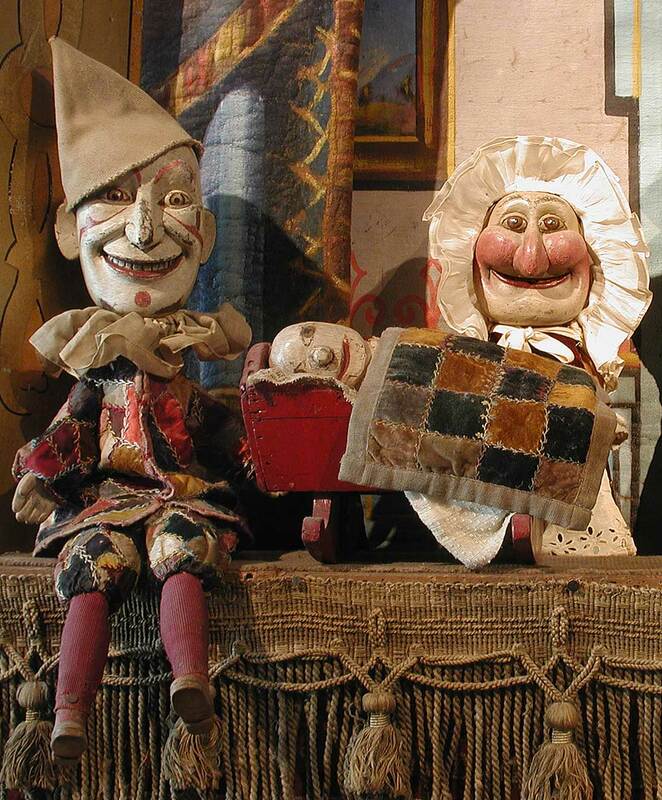 Going back several centuries, Punch and Judy were most definitely the First Comic Characters. Their look and styling is unique. It was chronicled quite beautifully, and, once and for all, definitively, by George Cruikshank in 1828. The tradition traveled across the sea to The New World, where it continued, and realized its finest hour in the able hands of a talented young artist and sign painter, Clarence Augustus "Gus" White, born in 1859, in Goshen New York. 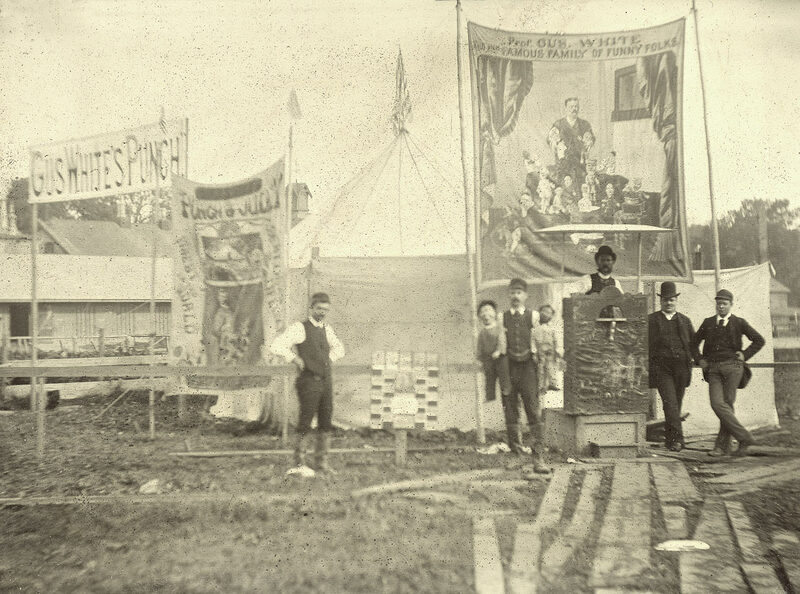 Gus went to a Fair when he was 17 years old, and saw a Punch and Judy Show. He came away saying, “I can do better than that!” And proceeded to do so! 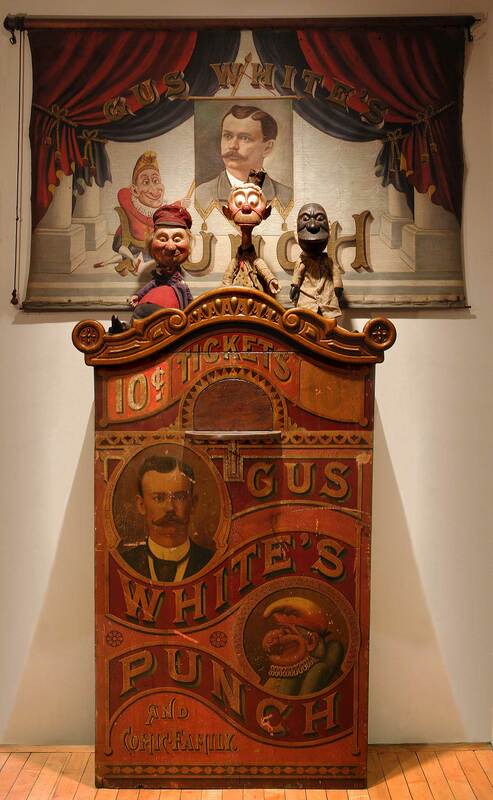 Young Gus carved the puppets out of wood, built a theatre, painted the scenery, and created “Gus White’s Punch and Comic Family”, working only from his memory of that show. For the next half century, Gus traveled with his one-man production, up and down the East Coast to places as far away as Boston, Cleveland, New York City and Canada. But he always returned to his home base of Goshen, where he practiced the trade of sign painting. 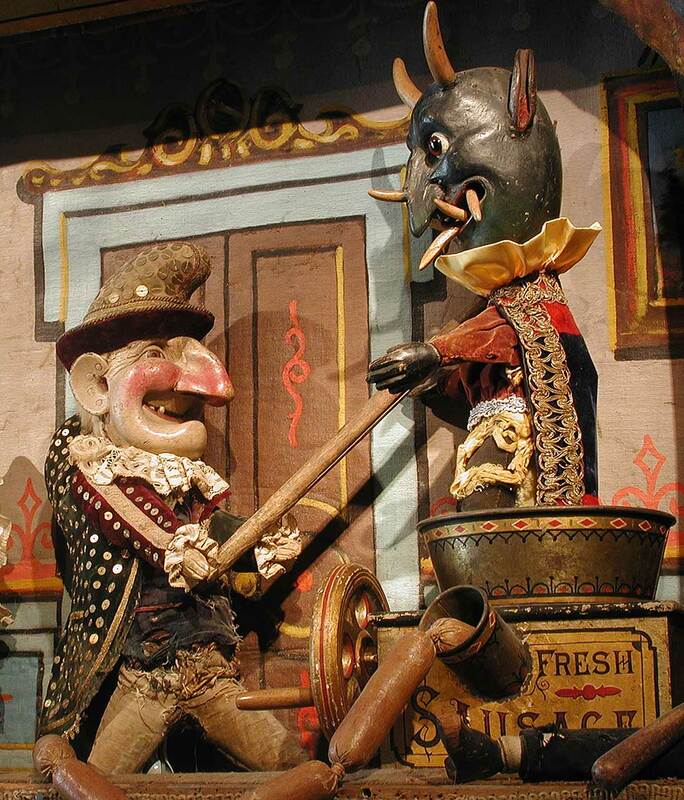 When Punch and Judy’s popularity waned, he painted signs, full time, until he died, at the age of 75, in1934. Gus was buried in an unmarked pauper’s grave, beneath a tree in the State Hill Cemetery in Goshen. 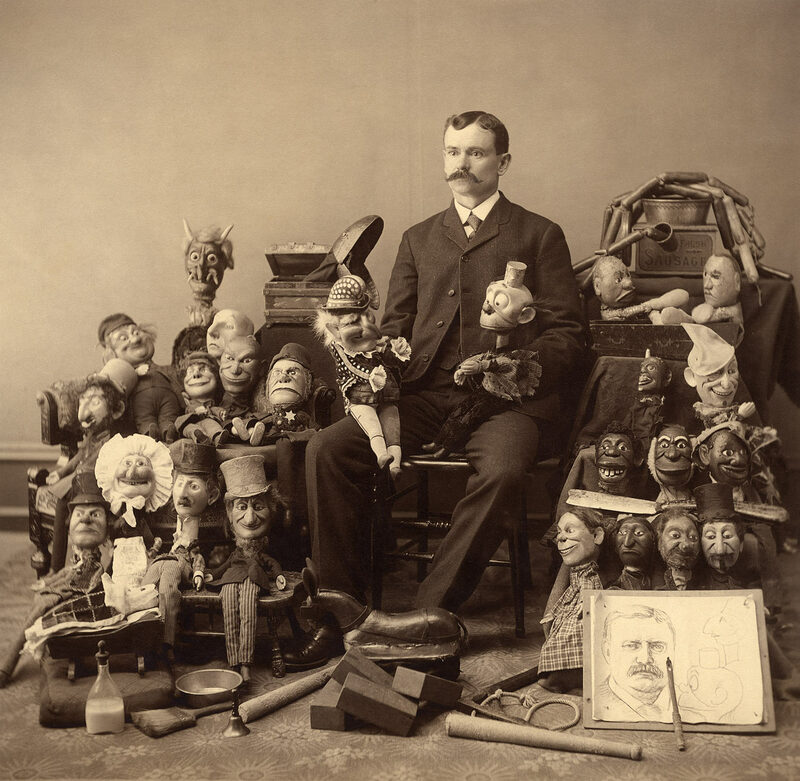 There was a fire, in 1905, in which some of the puppets were destroyed. But Gus was doing a show, elsewhere, at the time, and the stage and most of the cast of “Little People” survived. After Gus passed away, the stage and the remaining players were given to Gus's great nephew, Harold White, who loved and cared for them all his life. There is an ironic story that Harold tells. I have a video of him recounting it that will, eventually, be posted on the Gus White website. When Harold was 9 years old, Walt Disney visited Goshen. 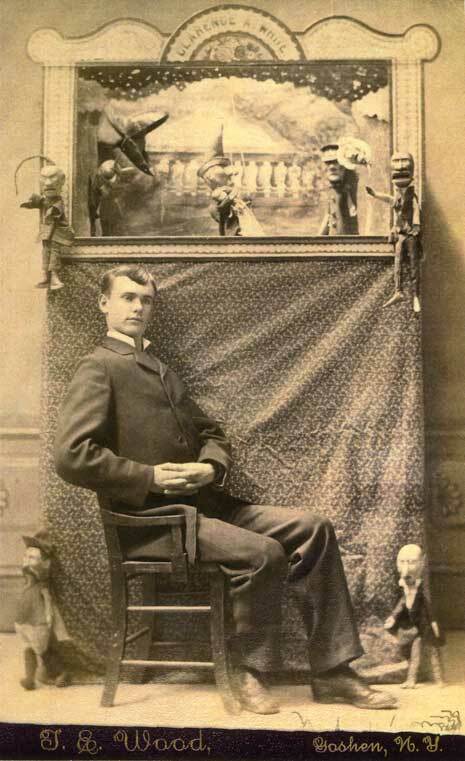 He saw the Punch and Judy show and offered young Harold a handsome price to buy the puppets, saying they were the finest Punch and Judy he had ever seen. Harold, emphatically, said, No! In 1992, Harold White’s health was not good. 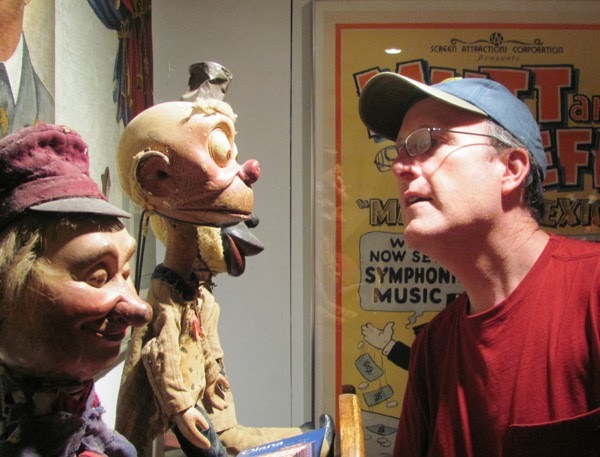 Therefore, he and his family put Punch and his Comic Family up for auction at the Mark Vail auction Gallery in Walden NY, hoping that his beloved “Little People” would find a good home. Their fear (and mine) was that a folk art dealer would purchase them, or worse still, a group of them would pool their resources, and divide up the show. The auction took place on October 24, 1992 on a rainy night in Walden. I was determined to not go home without them. For days beforehand, Eunice and I had discussed how much we should bid. Each time, the sum grew higher. Sitting there, that night, we were getting more and more uptight. Folk art dealers were running, back and forth, to and from the telephone. Eunice was convinced that there were movie stars in the audience. 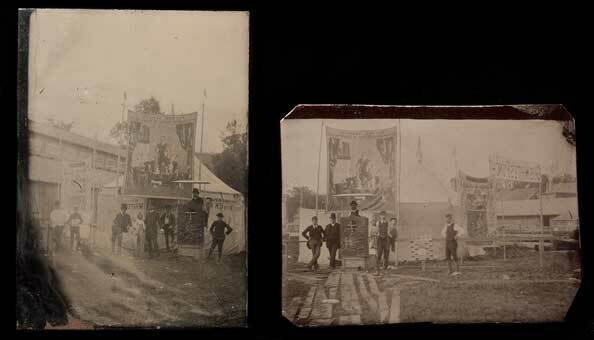 So, without further ado: Here is the curtain and the ticket booth, and three of the puppets. In the center, is Happy Hooligan. He joined the troupe in 1902, and thus the link with Comic Characters was made complete! A hundred years ago, Happy Hooligan was the latest Little Person to join Gus White’s Comic Family. Ultimately, he was the last. And here’s the stage, and some of the main actors. Actually, this is only the proscenium, and one of the scenes, attached to a holder that I constructed for display. 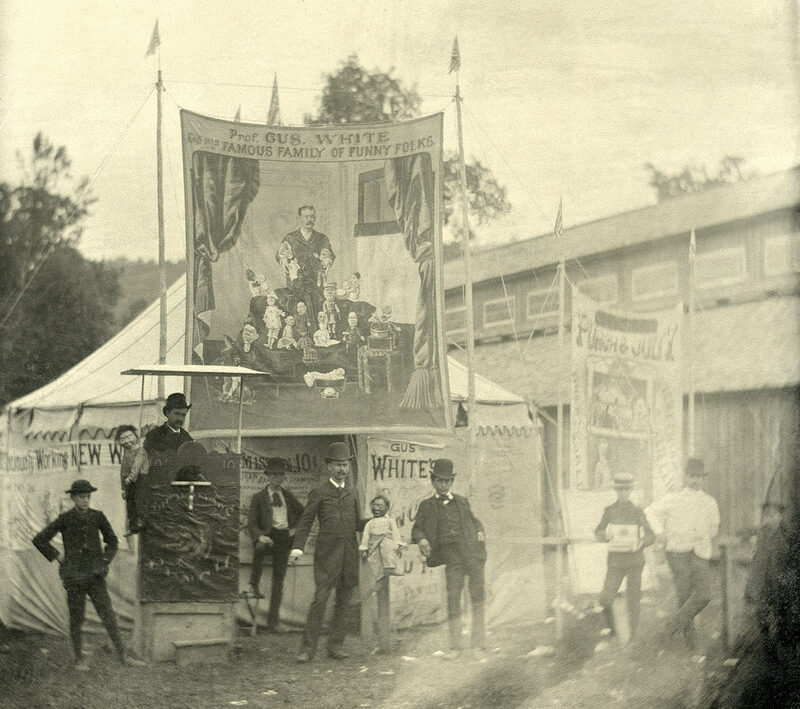 The actual stage with all its portable framework and complex paraphernalia, when assembled, stands ten feet tall and three feet deep. It is complete with all the other scenery and props, and everything, in two huge cases that resemble coffins, in size and shape. The Stage is exactly as it looked in Gus’s day, only less deep. The impressive fringe is all original. 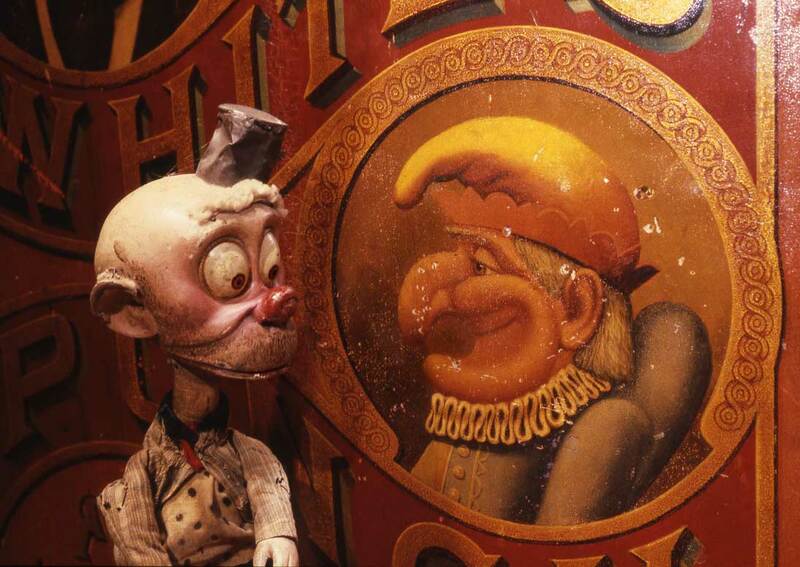 Starting on the left, is the Clown He was obviously patterned after America’s most famous Clown, "Humpty Dumpty". He is the one puppet I have finished restoring. That is another story, to be told another day. Suffice it to say, I wouldn’t dream of “fixing up” any remnant of the original clothing, no matter how worn out or moth eaten it was. 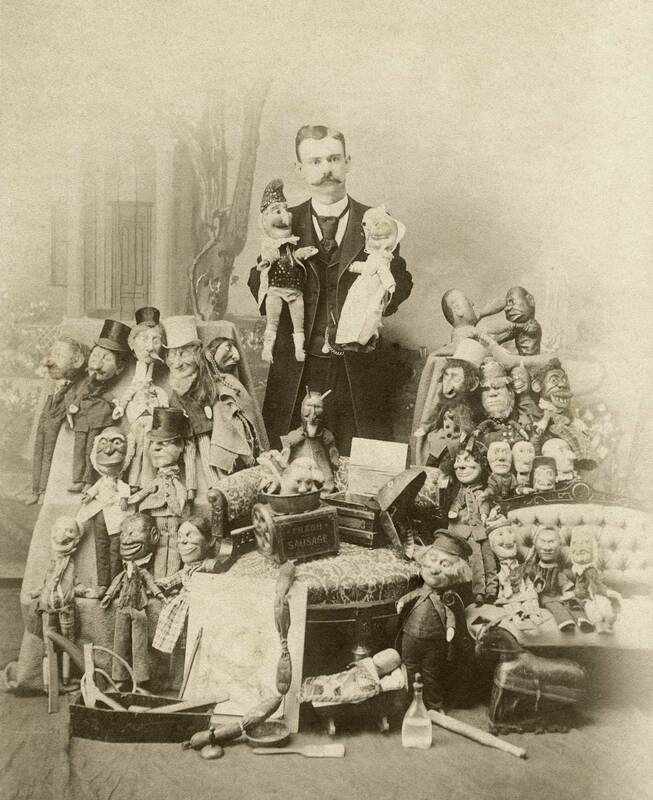 Unfortunately, several years previously, Harold and his well-intentioned family decided to “spruce the puppets up”. Thus, they redressed many of them with red and turquoise corduroy and other modern stuff, much of which was applied with airplane cement. Thank God, for acetone! Miraculously, at the time, someone suggested that Punch's original coat should be saved, so it was placed in a brown paper bag, both halves. It had been cut into two pieces, haphazardly, up the back. I sewed it back together again, and was able to detect the size and placement of every sequin. The ones I found to replace them are absolutely authentic, so are some remnants of the braid. His hat, all except for the brim, which I had to make, was hiding under a new bright red one. So Punch is pretty much all original again, his pants are a total mess, but they are original, so they will stay unchanged. Therefore, rest assured all ye purists, who find the fact that I am “restoring” these puppets, disturbing. I’m not “restoring”, I’m merely un-sprucing! That's quite a different thing! Believe me, I am a purist too. Every patch on the clowns patchwork clothes is a perfect match to the original, and all the fabrics used are 100 years old. Even the color of every stitch of the embroidery is correct, the original knots remained on the back for me to match. I bought a book to learn the stitch. Next is the Baby who Punch immediately dispatches in the play, and then, is Judy. Her bonnet is only temporary; one day, I will recreate the original. And next is Punch, who, as I mentioned above, is about as restored as he will get. All those sequins are original hammered copper, plated in gold. They, too, are a hundred years old. Each is a perfect match and placement for those that were lost, even before the sprucing up. And next is the Devil. He can stick out his wooden tongue, and his neck operates like an accordion. It can extend, like a giraffe, although, when I got him it was stitched in place. Here, he is emerging from Punches’ lethal Sausage making machine, which was the fate of every character in the play. In Gus White's version, anyway. Each one was ground up to became personalized sausage links. The Chinaman’s links, for instance, had a pigtail on the end. And last, is the Policeman. He was not in the auction. Harold brought him to me, afterwards. 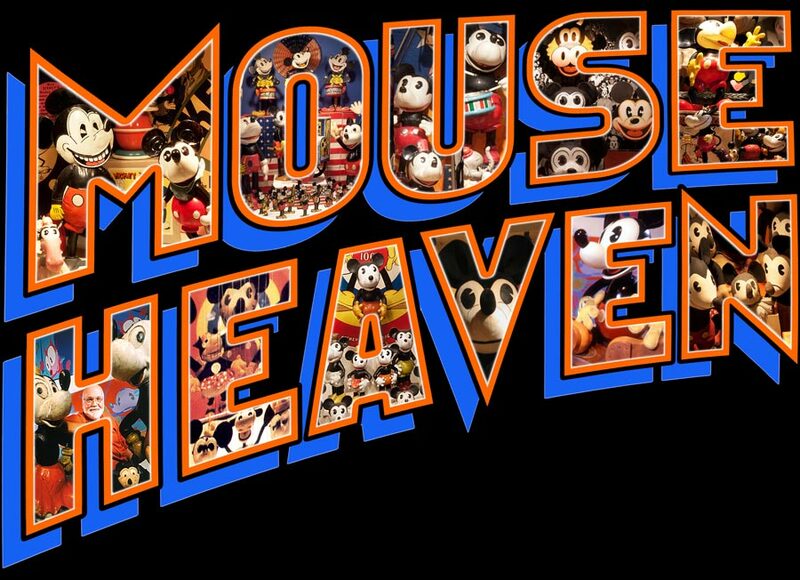 I believe both Harold and his wife Roberta were pleased as Punch that the Little People came to live, here, in Mouse Heaven. 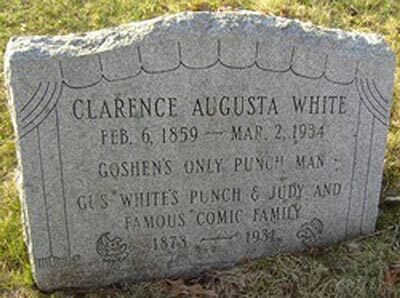 One element that makes Gus White’s vision of Punch unique, and uniquely American, is the fact that he transformed the classic characters of the traditional English Punch into American ethnic stereotypes: a Chinaman, an Irish Washerwoman, an Irish Cop, several Black Men, a Jew, a Drunkard, and among those that were lost in the fire was even one who resembled Uncle Sam. There are also a whole arsenal of weaponry and instruments of death. In the event you don’t know the plot of Punch, it's simple. Punch is a total scoundrel who does in everyone he meets, including the Devil, and evil triumphs in the end! Gus was a quick sketch artist of great prowess. 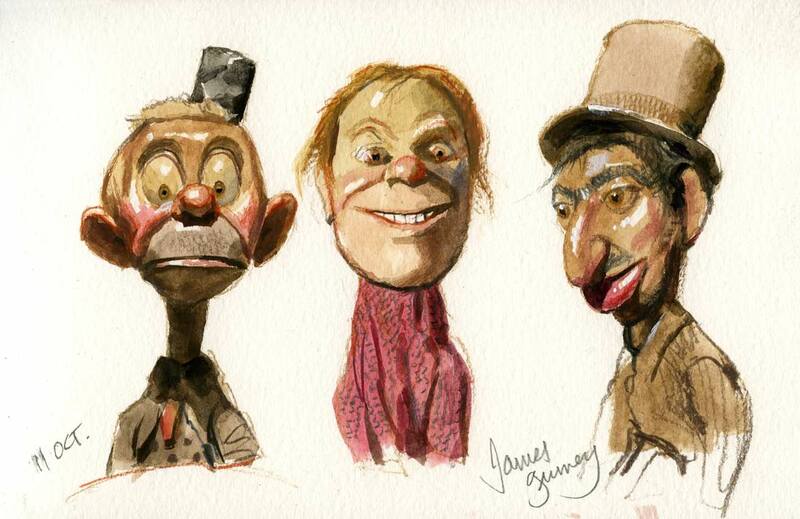 One highlight of the show took place when Punch drew caricatures of famous people and members of the audience. Gus had fashioned a special attachment that enabled Punch to hold a piece of charcoal. And so, while Gus peeked through a hole in the curtain, to secretly see the subject, Punch did the drawing. These drawings were amazing, as you will see. Among the treasures that came with the theatre were a few fragments of the past that proved to be Fantastic. This official photograph is one. It shows Gus in his younger days. Many of the puppets are as they are today. And, of course, there are several that were lost in the fire of 1905. But Punch and Judy, here, seem different. Possibility, they were earlier versions than those that survive today. One marvel of the computer is its ability to dig deep, and peel away the veil of time. A modern scanner can squeeze every drop of imagery from even the most seemingly insignificant remnant of ancient photography, and reveal a wealth of detail that is hidden from the naked eye. And much Magic can happen when a computer is equipped with Photoshop. Let’s take another look at that small photo. As impressive as that appears to be, you aint seen nothing yet! Here are two small tintypes. The images are dark and obscure. They look insignificant, in person. And for some reason, the images are reversed. Now let’s show them to the scanner, and let the Magic begin. Here are the originals, actual size. And, one more! This was a different challenge. It was faded to a faint image, on the verge of disappearing. Photoshop pulled it from the brink of oblivion. This appears to be some kind of Fair. 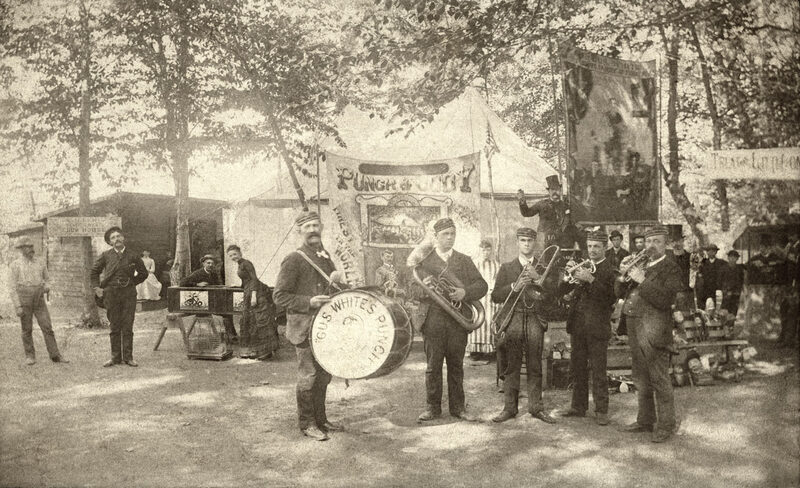 Many of Gus’ performances were preceded by a band to attract an audience. One can sense what it was like to be there. Strike up the band! Isn’t this Amazing! The Christmas after the auction, I took a colored photo of the stage, crowded with many of the players. Then, I got a print made, placed it in a gold frame, and sent it to Harold and Roberta, as a sort of Christmas present, just so the Little People would still be with them, in a way. I knew Harold missed them. They had become a big part of his life. Parting with them wasn’t easy for him. The following Christmas, a package arrived here. It was a present from Harold and Roberta. The most beautiful present I have ever received. In it was this georgeous photograph circa 1905. This is the real thing, sealed in an elegant antique frame, where, clearly, it has been for the past century. This is most certainly Gus White's own copy of this Fabulous Photograph. It sits here on the desk beside me where I can see it every day. For all their generosity, I don’t think even Harold and Roberta realized how much this present meant to me. It was every bit as moving as getting the puppet theatre in the first place. A year or two ago, a young lady called me from the Goshen Historical society. She was mounting a memorial exhibit in honor of Gus White, and asked if I could supply photos large enough to print large for an exhibit. Therefore, I filled a DVD with images and sent it to her. In the process, I did the unthinkable; I carefully removed this photo from its sealed frame and put it on the scanner. I never heard from her again. I don’t even know if the exhibit took place. But I did get a perfectly scanned image of this perfect photo, something I would never have done for myself, and I will share it with you now. This is Gus White at the very Pinnacle of his career. Here, too, is his complete company of actors, as they appeared in their heyday. Gus is looking inhumanly great, like the paintings of himself that decorate many a sign and banner, advertising Gus White’s Punch and Comic Family. On the drawing board is Punch’s lightning fast sketch of Teddy Roosevelt, and Happy Holligan, evidence that his drawings were Great! 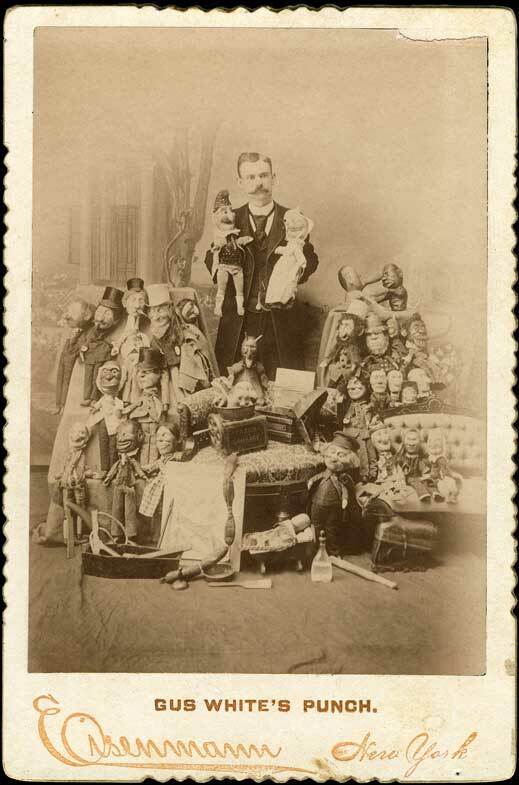 I have often stared deeply into this photograph for hours, studying how the puppets ought to be, and mourning those that have gone away. Oh, and, by the way, after the auction, Harold and Roberta White invested some of the proceeds from the sale in a handsome stone marker, carved in the shape of a puppet theatre, to adorn Great uncle Gus White’s grave. James was particularly fascinated by Gus White’s Punch and Comic Family. In a moment of inspiration, he took out his sketchbook and created a fabulous portrait of Happy Hooligan. He then proceeded to the other room where he added the Irish Washerwoman, and the Jewish Peddler, two of Gus White’s Little People, who have not been properly pictured, until now. This event became an entry in Jims amazing blog,“Gurney’s Journey,” which you can see right HERE.